Driving for Tony Stewart can be a dirty business, says Donny Schatz. Donny Schatz and Kraig Kinser, who wheel Stewart-owned sprint cars on the World of Outlaws circuit, joined Stewart for his media availability at Lowe’s Motor Speedway on Thursday. They’ll be racing at the dirt track across the highway from the speedway Friday night. 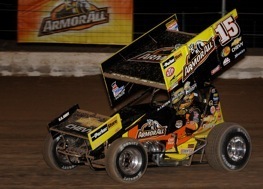 Schatz said Stewart is a fun person but a supportive boss – and a good race driver. “He’s a great person to be around,” Schatz said. “Obviously, they’ve had a team for some time and I’m kind of new to the picture here last year. But having the versatile Stewart for a boss means having someone who can’t be fooled about the cars. Kinser said Stewart doesn’t get to see him race that much, but he’s still an involved owner. Sometimes it takes bad times to establish a good relationship, and for Kinser and Stewart the bad moments came early on. “I think my relationship really grew with him my first couple weeks on the job,” Kinser said. “I think I totaled two or three of his race cars, right in the first three races of the year. I was really down on myself, and I really didn’t want to start my career with him with me tearing everything up. Stewart is using the same philosophy that is propelling his Cup team on the dirt outfits. He hired capable people and delegates the responsibility to them. On his Cup team, one of the key players is competition director Bobby Hutchens. On the WOO circuit, it’s Jimmy Carr, a former driver and crew chief who has been with the team since it was started – with Danny Lasoski driving – in 2001.